As NASA’s craft Curiosity made it’s landing on the surface of Mars, I was listening to the live feed while working on phrasal verb flash cards for my students. In the moment the NASA control room waited with baited breath to received the signal and photos from the craft, that it had in fact landed, I also heard the loudspeaker on the local mosque broadcast the muezzin’s chant, sending the faint sound of “Allah u Akbar…” into my office; my Muslim neighbors were praying, and as it is Ramadan, also fasting from food and drink. Some of my students were cooking lunch, others cleaning the school in preparation of the new semester. In the US, the Sikh community in Milwaukee, WI was reeling from an inexplicable act of violence and hate against them. Six dead, shot in cold blood, desecrating their holy place of worship. Someone I know lost their mother that day after a fall, and another person’s mother was breathing her last breaths, having walked more than 99 years on this earth. Athletes from all corners of the world competed to be swifter, higher, stronger at the Olympic Games in London; world records were broken, as humans do indeed push the limits of their own bodies. On that day, the 6th of August, back in 1945, the US unleashed a weapon of mass destruction on the city of Hiroshima, Japan, instantly killing many thousands and destroying a city. From the earth to the moon, and now to Mars, we have such capacity to advance technology, to accurately place a craft on a distant planet. We also know how to create total destruction. We dare to run faster and jump higher than any human before. Meanwhile, billions of people live out their daily lives, working, playing, and eventually dying. In Balige, that evening (6 August 2012), I went with some of my students to see the body of someone who had died; she was 85. 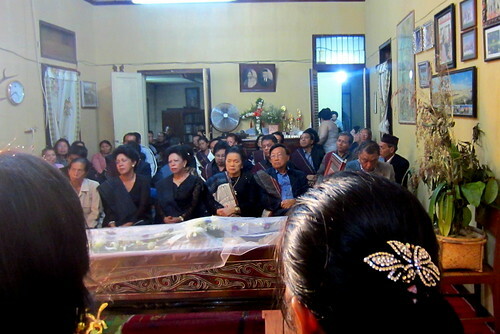 In Batak culture, when an old person dies, they do not mourn in black as in western culture. Here, they have a party and they wear their ulos (traditional blanket). As is customary at death, the body is laid in the home and family and community come to visit. And so, beneath large tents, people gathered to sit. A band played traditional Batak music, while other people visited the body. My students came to pay respects because the woman who was a friend to the deaconess students. We sang hymns, for which the band provided the music; we prayed; and then we greeted each of the family members with the customary handshake, placing the right hand to the heart after shaking. What a beautiful and poignant summary you have given here of these events of last week–glorious and tragic, sad and beautiful. I feel so glad when I read of your life there and of the ways you are immersing yourself in the culture, giving of yourself so fully and also receiving so much from the people. It seems like time out of time as I read.